Crave Brothers Farmstead Cheese handcrafts specialty, artisan cheeses on their farm in rural Waterloo using the fresh milk from their dairy. They manufacture Fresh Mozzarella, Mascarpone, Farmer’s Rope string cheese and Les Frères and Petit Frère French-style cheeses with care using Old World techniques. Crave Brothers Farm and Crave Brothers Farmstead Cheese are sustainable family businesses – committed to caring for the land and cows with the highest regard, working closely with employees and customers and serving as a community leader and contributor. The Craves utilize an anaerobic manure digester to convert waste from their cows into enough electricity to power their farm, cheese plant and over 300 area homes. The four Crave brothers are proud to produce and promote high quality milk and award winning cheese, along with producing green energy. 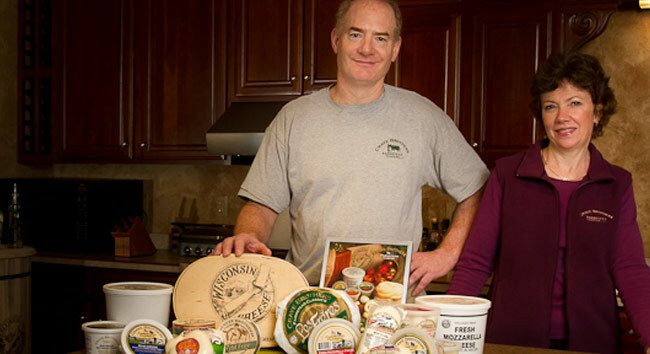 Crave Brothers has received numerous national and international awards for all their cheese varieties, and was named Dairymen of the Year at the 2008 World Dairy Expo. View a complete list of their awards.